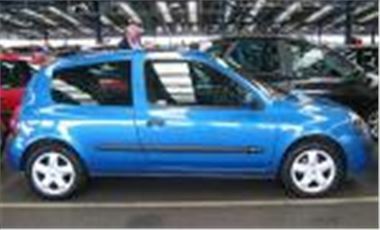 Renault Clio Authentique 1.2 5dr £6041 Save £2889 new and unregistered. Price includes Vehicle Excise Duty, Delivery and VAT. Renault Clio Extreme 1.2 3dr £6347 Save £3038 new and unregistered. Price includes Metallic Paint, Vehicle Excise Duty, Delivery and VAT. Renault Grand Scenic Dynamique 1.9dC1 130bhp £13835 Save £5185 new and unregistered. Price includes Metallic Paint, Vehicle Excise Duty, Delivery and VAT. Renault Grand Scenic Dynamique 1.6 £12265 Save £4505 new and unregistered. Price includes Metallic Paint, Vehicle Excise Duty, Delivery and VAT. Renault Grand Scenic Privilege 1.9dC1 130bhp £14535 Save £5585 new and unregistered. Price includes Metallic Paint, Vehicle Excise Duty, Delivery and VAT. Renault Scenic Dynamique 1.9dCi 130bhp £13135 Save £4885.00 New and unregistered. Price includes Metallic Paint, Vehicle Excise Duty, Delivery and VAT. Renault Scenic Expression 1.6 £11215 Save £4065 new and unregistered. Price includes Metallic Paint, Vehicle Excise Duty, Delivery and VAT. Renault Scenic Privelage 1.9dCi 130bhp £13835 Save £5185 new and unregistered. Price includes Metallic Paint, Vehicle Excise Duty, Delivery and VAT. Honda Civic 1.4i SE 5dr Manual £9935 Save £3240 pre registered at point of order with factory delivery mileage only. Price includes metallic paint, Delivery, VAT and the balance of Vehicle Excise Duty remaining and UK manufacturers warranty. Honda Civic 1.6i VTEC SE 3dr £9466.00 Save £3708 pre registered at point of order with factory delivery mileage only. Price includes Metallic Paint, Delivery, VAT and the balance of Vehicle Excise Duty remaining and UK manufacturers warranty. Honda Civic 1.6i SE VTEC 5dr Manual £10485 Save £3190 pre registered at point of order with factory delivery mileage only. Price includes Metallic Paint, Delivery, VAT and the balance of Vehicle Excise Duty remaining and UK manufacturers warranty. Honda Civic 1.7i CDTi SE 3dr £10311 Save £3364 pre registered at point of order with factory delivery mileage only. Price includes Metallic Paint, Delivery, VAT and the balance of Vehicle Excise Duty remaining and UK manufacturers warranty.